The Leven Car Company are proud sponsors of SuperCLAN. We were delighted to sponsor another fantastic Superclan event in aid of CLAN Cancer Support! Driver’s enjoyed some fantastic weather, whilst taking some of Scotland’s most scenic roads. It was great to chat with so many familiar and new faces and have such a fantastic welcoming reception at the Marcliffe upon our return. This year we decided to take along a few cars from our Aston Martin showroom. 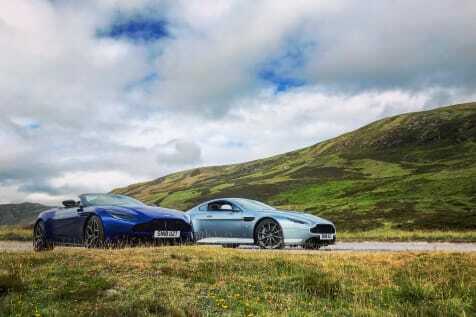 These were our deadly V12 Vantage S and gorgeous Zaffre Blue DB11 Volante Demonstrator, which came in handy for the stunning sunshine we received throughout the drive! "SuperCLAN™ is an event like no other, that brings the worlds' finest Supercars together on a drive and showcase to raise donations for charity. The success of the event continues to grow year on year, however, can only happen with your support. Please dig deep and donate to a charity that offers nothing short of an invaluable service - CLAN."